A video was posted to WorldStarHipHop that appears to show a Maryland substitute teacher beating students with a belt. 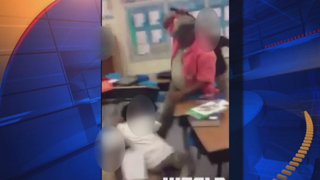 A Prince George's County, Md., substitute teacher has been suspended after video footage appeared on WorldStarHipHop that shows the teacher beating students with a belt. On May 15 a student at Gwynn Park Middle School in Brandywine, Md., recorded footage that appears to show a substitute teacher striking several students with a belt while other children can be heard screaming, according to Fox 5 DC. The school district would not release the teacher's name but did note that the teacher had been removed from the classroom. It is unclear in the footage whether the students were hiding from the teacher or roughhousing with one another, but it does appear to show the substitute teacher doling out at least three hits with what appears to be a belt. Prince George's County Public Schools issued a statement, viewed by Fox 5 DC, condemning the substitute's behavior and adding that the matter has been turned over to law enforcement: "On Friday, May 15, a substitute teacher used improper actions to discipline students while in one of our classes at Gwynn Park Middle School. "The substitute teacher has been removed from the classroom and the matter has been referred to the appropriate law enforcement agencies," the statement continued. "Prince George's County Public Schools does not condone this type of behavior and it is not representative of the level of professionalism and respectful conduct of the team at the school. PGCPS works to create a respectful and safe environment for all students and staff."